Geneva (AFP) - The wife of an imprisoned former aide to deposed Egyptian president Mohamed Morsi is in Geneva this week seeking UN help to free her husband and end "horrific" rights abuses at home. "I'm speaking up to the international community because they have an obligation to make a strong statement about these huge wrongs that are happening in Egypt," Sarah Attia told AFP. "The fact that so many people are still suffering, the fact that my husband is still in prison, says to me that they have not done enough," the 33-year-old said. Attia's husband Khaled al-Qazzaz was arrested in July last year along with Egypt's ousted Islamist president Mohamed Morsi. Qazzaz, who was Morsi's top foreign policy aide but not a member of the president's now-banned Muslim Brotherhood, has been detained for nearly 420 days without charge. Following the toppling of Morsi, Egypt's first democratically elected president, the authorities have cracked down on the Brotherhood, with some 1,400 people believed killed. An estimated 15,000 more have been imprisoned, and hundreds have been sentenced to death in speedy mass trials in what Attia described as "kangaroo courts". The mother of four voiced concern however that just speaking about the case could put her husband at risk of "fabricated charges". "I wake up every day fearing the worst for my family, for my husband." Speaking ahead of meetings with the office of the UN High Commissioner for Human rights, Attia voiced hope the international community would step up and help the "tens of thousands of people who are suffering in Egypt from horrific human rights abuses". As a Canadian citizen, she said she wants to see the country she was born and raised in do more to help her husband, a permanent Canadian resident. When Qazzaz was arrested -- on his 34th birthday -- his wife and children had been waiting at home to celebrate. "He never came home," she said. Attia said she had not known where Qazzaz was being held for the first two months, although he had been allowed to call occasionally. She said she has learned distressing details about his conditions at the Tora prison in Cairo. "For the past 418 days, he has been held in solitary confinement, in a tiny cell, with very little human interaction (and) no access to sunlight. He does not know day from night." The prison conditions have caused severe damage to Qazzaz's spine, and he is in desperate need of an operation, she said, warning that he could be permanently disabled. 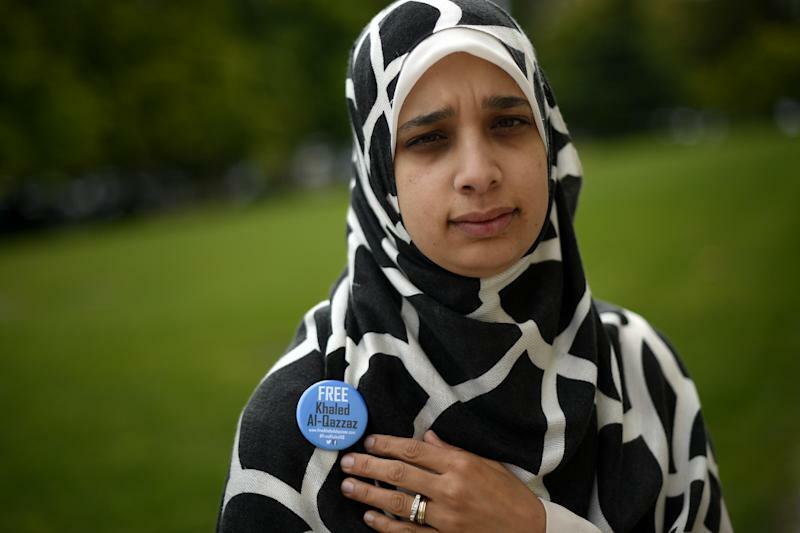 Attia said she left Egypt for Canada in April over fears she too could face arrest.